Thanks to everyone who came out to my talk about the early Continental artillery at Longfellow House–Washington’s Headquarters last night. Among the episodes I related was Capt. John Callender’s court-martial on the charge of “Cowardice” at Bunker Hill. Five days after arriving in Cambridge, Gen. George Washington affirmed that Callender should be booted out of the army. I was determined to avoid doing what every version of that story I’ve seen does, and go on to describe how Callender traveled to New York in the fall of 1776 as a volunteer “cadet” in Capt. John Johnson’s artillery company. I steeled myself not to say that when Johnson and his lieutenant were wounded in the Battle of Brooklyn, Callender took command of that company until the British captured him and the other survivors. 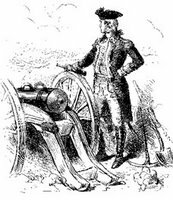 And that after his release, Callender received a captain-lieutenant’s commission in the Continental artillery dated 1 Jan 1777 and served to the end of the war. So you may well read that about Capt.-Lt. John Callender. But you didn’t hear it from me.